To make the most of your bulk-bin shopping, bring your own containers. A store system should be in place where your jar can be weighed and labeled before you fill it. You don't have to be a zero-waste social influencer to tap into what is happening in today's bulk-bin aisle. It may well be the most dynamic place to buy much of what you need to live well — or at least with a nod to sustainability. What was once the destination for a small number of environmentally conscious souls now draws customers shopping for economic, cultural, medicinal, and even political reasons, says Kenneth Yates, a manager at the Takoma Park-Silver Spring Co-op in Maryland. Oats, dried beans, and trail mix have filled the scoop and gravity bins for decades. But they now share display space with bulk offerings of shampoo and laundry detergents, spices and wellness herbs, teas and coffee beans, oils and vinegars, liquid sweeteners and edible insects, in several flavors. There’s a difference between “bulk” and “bulky,” so do not be put off by the term. Bulk bins afford the opportunity to acquire items great and small. You will often pay less per pound for the same foodstuffs packaged elsewhere in the store, and you can save money by purchasing just the amounts you need. Stores committed to reducing food waste, such as Dawson’s Market in Rockville, Md., even give their employees 25-cent bin deals on bruised produce and nearly expired items. The “aisle” extends to shopping in bulk online, which is not the same as, say, loading up on dual-bag cereal boxes at Costco.com. Azure Standard of Oregon ships fresh and shelf-stable foods directly to consumers nationwide, and in some parts of the country, its trucks deliver to locations for customer pickup, which saves on shipping costs, especially for heavy goods. 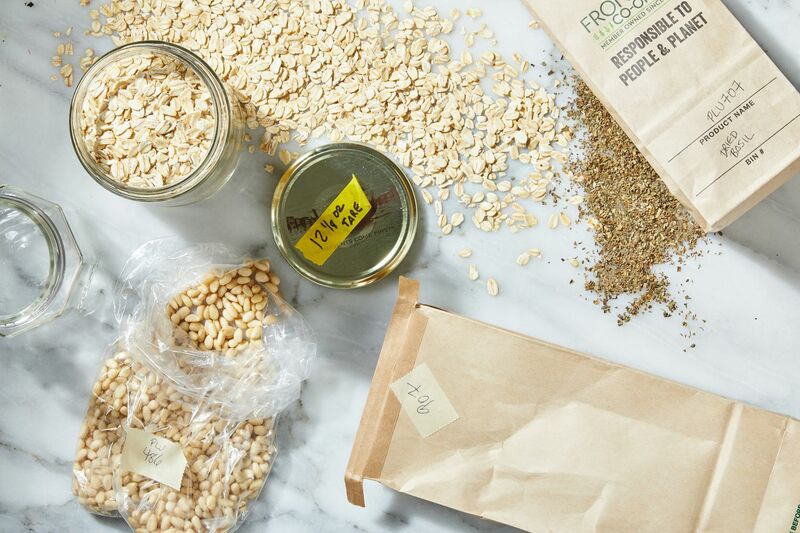 Frontier Co-op also sells in bulk online, but you might be more familiar with the green-lidded, large glass jars on the bulk aisles of natural foods markets such as Mom's and Yes Organic. Customers use recyclable small scoops and spoons to dish out pennies' worth of spices and dried herbs that are most likely fresher than what is in their own cabinets. You might wonder if bulk bin buying is such a win-win for sustainability and household food budgets, why haven’t we seen it flourish in all supermarkets? One reason might be the fallout from concerns about food safety. In a 1983 Washington Post story on FDA guidelines for bulk-food retail sales, there were tales of shoppers’ hands dipping into bins for sampling and worries that enforcement by local health departments would be hit-or-miss. To ensure freshness when you buy coffee beans in bulk, look for ones stored in an airtight gravity bin and not in an open barrel. The bins should look clean and oil-free. Some markets’ bulk-bin aisles are managed more efficiently than others. A visit to one co-op reveals a near-ideal scenario with more than 200 items. The area is spotless, monitored on the half-hour. Customers fill their preweighed containers brought from home. Airtight gravity bins are a midrange height, made of BPA-free materials, and, most important, are filled with what works best in them, such as dried beans, nuts, wrapped candies, seeds, and rice. Wider scoop bins hold granolas, dried fruits, flours and grains, and closed, rolling bins contain “high-volume” items such as oats and flours. Be a thoughtful shopper. Filled a bag, then changed your mind? Don’t leave it on the bulk-bin shelf; instead, take it to the help desk. Do not use the same scoop for different bins. It doesn’t take long, either, to develop a touch for working the gravity bins — those clear, vertical self-serve containers that can send out far more product than you intended to take. Bring your own containers. This is a commitment, but if you trained yourself to carry reusable shopping bags, you can do this, too. The store should have a place where your jar can be weighed and labeled before you fill it. That weight will be subtracted from the filled amount at checkout.